My GrandBettye (my dad’s mom) was the most amazing cook. Whenever we went to visit her and GrandaddyJoe in Corpus Christi, Texas, there would be piles and piles of desserts covering every surface in the kitchen awaiting us. She was the very definition of a southern lady. I loved visiting them; GrandBettye believed that kids should eat as many cookies as they want, and my GrandaddyJoe and I used to hide in their walk-in pantry, where he’d teach me how to peel the shells off Reese’s Pieces and we’d eat all the Hershey’s Kisses before GrandBettye could use them to make more peanut butter thumbprint cookies. That house was heaven. Rumor has it GrandaddyJoe’s mom was an even better cook, and she would always alter her recipes before sharing them so no one could make them quite as well as her. She took her famous coconut cake recipe to the grave with her, and it drove GrandBettye mad that she couldn’t cook quite as well as her husband’s mom. Perhaps in retaliation, she shared all of her own recipes and I’m carrying that tradition on. 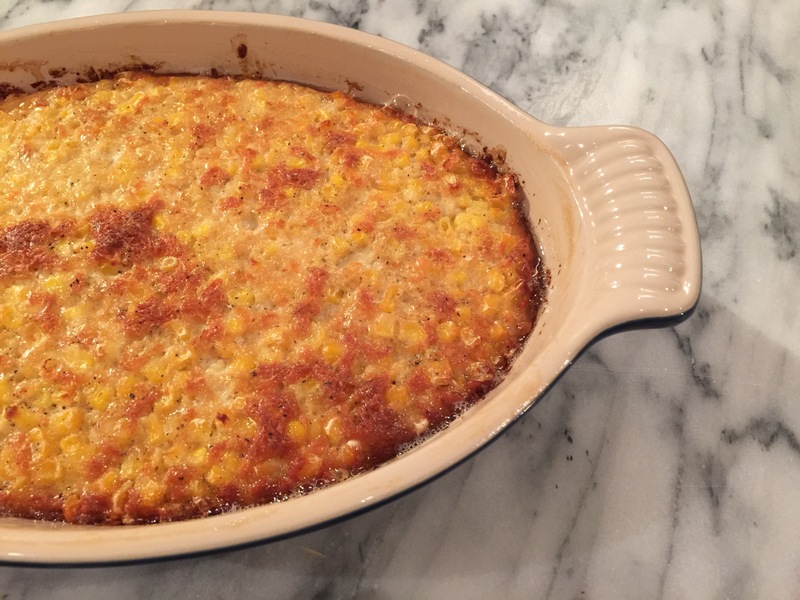 This one, her corn pudding, is one of my favorites. I took over making it every Thanksgiving and Christmas; it’s my brother Billy’s favorite and now Tony requests that I make it on his birthday, too. We had our caterer make it for our wedding, so GrandBettye could be a part of the day even if she couldn’t be there. It’s the recipe I’m asked for the most, of all the things I make when we have friends over for dinner. We’re hosting Thanksgiving here at our house this year, a first for us. I can’t wait to bake this next Thursday, and I thought you might want to, too. It’s super easy and sososo decadent and delicious. Think of GrandBettye if you do! Preheat the oven to 350 degrees. Grease a large glass baking pan (or 2 small/medium size pans). In a large mixing bowl, beat 4 eggs. Add in the milk, flour, sugar, melted butter, salt, and pepper; whip them together. Stir in the cheddar cheese. Last, thoroughly mix in the frozen corn (if you put it in first, it will start to freeze the other ingredients.) Dump it in the glass pan and bake for 50-55 minutes, or until the top is browned and the edges crispy. (If I double this recipe, it will sometimes take an hour to bake. For the pictures for this blog, I cut the recipe in half since it was just me and Tony eating.) ENJOY!